As I was posting some remarks on the Exercises that come with Feynman’s Lectures, I was thinking I should do another post on the Principle of Least Action, and how it is used in quantum mechanics. It is an interesting matter, because the Principle of Least Action sort of connects classical and quantum mechanics. Let us first re-visit the Principle in classical mechanics. The illustrations which Feynman uses in his iconic exposé on it are copied below. You know what they depict: some object that goes up in the air, and then comes back down because of… Well… Gravity. Hence, we have a force field and, therefore, some potential which gives our object some potential energy. The illustration is nice because we can apply it any (uniform) force field, so let’s analyze it a bit more in depth. In the mentioned post, I try to explain what the formula actually means by breaking it up in two separate integrals: one with the kinetic energy in the integrand and – you guessed it 🙂 – one with the potential energy. We can choose any reference point for our potential energy, of course, but to better reflect the energy conservation principle, we assume PE = 0 at the highest point. This ensures that the sum of the kinetic and the potential energy is zero. For a mass of 5 kg (think of the ubiquitous cannon ball), and a (maximum) height of 50 m, we got the following graph. Note the integrand: KE − PE = m·v2. Strange, isn’t it? It’s like E = m·c2, right? We get a weird cubic function, which I plotted below (blue). I added the function for the height (but in millimeter) because of the different scales. So what’s going on? The action concept is interesting. As the product of force, distance and time, it makes intuitive sense: it’s force over distance over time. To cover some distance in some force field, energy will be used or spent but, clearly, the time that is needed should matter as well, right? Yes. But the question is: how, exactly? Let’s analyze what happens from t = 0 to t = 3.2 seconds, so that’s the trajectory from h = 0 to the highest point (h = 50 m). The action that is required to bring our 5 kg object there would be equal to F·h·t = m·g·h·t = 5×9.8×50×3.2 = 7828.9 J·s. [I use non-rounded values in my calculations.] However, our action integral tells us it’s only 5219.6 J·s. The difference (2609.3 J·s) is explained by the initial velocity and, hence, the initial kinetic energy, which we got for free, so to speak, and which, over the time interval, is spent as action. So our action integral gives us a net value, so to speak. To be precise, we can calculate the time rate of change of the kinetic energy as d(KE)/dt = −1533.7 + 480.2·t, so that’s a linear function of time. The graph below shows how it works. The time rate of change is initially negative, as kinetic energy gets spent and increases the potential energy of our object. At the maximum height, the time of rate of change is zero. The object then starts falling, and the time rate of change becomes positive, as the velocity of our object goes from zero to… Well… The velocity is a linear function of time as well: v = v0 − g·t, remember? Hence, at t = v0/g = 31.3/9.8 = 3.2 s, the velocity becomes negative so our cannon ball is, effectively, falling down. Of course, as it falls down and gains speed, it covers more and more distance per second and, therefore, the associated action also goes up exponentially. Just re-define our starting point at t = 3.2 s. The m·v0t·(v0 − gt) term is zero at that point, and so then it’s only the m·g2·t3/3 term that counts. So… Yes. That’s clear enough. But it still doesn’t answer the fundamental question: how does that minimization of S (or the maximization of −S) work, exactly? Well… It’s not like Nature knows it wants to go from point a to point b, and then sort of works out some least action algorithm. No. The true path is given by the force law which, at every point in spacetime, will accelerate, or decelerate, our object at a rate a that is equal to the ratio of the force and the mass of our object. In this case, we write: a = F/m = m·g/m = g, so that’s the acceleration of gravity. That’s the only real thing: all of the above is just math, some mental construct, so to speak. Of course, this acceleration, or deceleration, then gives the velocity and the kinetic energy. Hence, once again, it’s not like we’re choosing some average for our kinetic energy: the force (gravity, in this particular case) just give us that average. Likewise, the potential energy depends on the position of our object, which we get from… Well… Where it starts and where it goes, so it also depends on the velocity and, hence, the acceleration or deceleration from the force field. So there is no optimization. No teleology. Newton’s force law gives us the true path. If we drop something down, it will go down in a straight line, because any deviation from it would add to the distance. A more complicated illustration is Fermat’s Principle of Least Time, which combines distance and time. But we won’t go into any further detail here. Just note that, in classical mechanics, the true path can, effectively, be associated with a minimum value for that action integral: any other path will be associated with a higher S. So we’re done with classical mechanics here. What about the Principle of Least Action in quantum mechanics? We have the uncertainty in quantum mechanics: there is no unique path. However, we can, effectively, associate each possible path with a definite amount of action, which we will also write as S. However, instead of talking velocities, we’ll usually want to talk momentum. Photons have no rest mass (m0 = 0), but they do have momentum because of their energy: for a photon, the E = m·c2 equation can be rewritten as E = p·c, and the Einstein-Planck relation for photons tells us the photon energy (E) is related to the frequency (f): E = h·f. Now, for a photon, the wavelength is given by f = c/λ. Hence, p = E/c = h·f/c= h/λ = ħ·k. We measure action in units of ħ, because… Well… Planck’s constant is a pretty fundamental unit of action, right? 🙂 So we write θ = S/ħ = p·r12/ħ. Again, S = p·r12 is just the amount of action we calculate for the path. Action is energy over some time (1 N·m·s = 1 J·s), or momentum over some distance (1 kg·(m/s)·m = 1 N·(s2/m)·(m/s)·m) = 1 N·m·s). For a photon traveling at the speed of light, we have E = p·c, and t = r12/c, so we get a very simple formula for the action: S = E·t = p·r12. Now, we know that, in quantum mechanics, we have to add the amplitudes for the various paths between r1 and r2 so we get a ‘final arrow’ whose absolute square gives us the probability of… Well… Our photon going from r1 and r2. You also know that we don’t really know what actually happens in-between: we know amplitudes interfere, but that’s what we’re modeling when adding the arrows. Let me copy one of Feynman’s famous drawings so we’re sure we know what we’re talking about. Our simplified approach (the assumption of light traveling at the speed of light) reduces our least action principle to a least time principle: the arrows associated with the path of least time and the paths immediately left and right of it that make the biggest contribution to the final arrow. Why? Think of the stopwatch metaphor: these stopwatches arrive around the same time and, hence, their hands point more or less in the same direction. It doesn’t matter what direction – as long as it’s more or less the same. Now let me copy the illustrations he uses to explain diffraction. Look at them carefully, and read the explanation below. When the slit is large, our photon is likely to travel in a straight line. There are many other possible paths – crooked paths – but the amplitudes that are associated with those other paths cancel each other out. In contrast, the straight-line path and, importantly, the nearby paths, are associated with amplitudes that have the same phase, more or less. However, when the slit is very narrow, there is a problem. As Feynman puts it, “there are not enough arrows to cancel each other out” and, therefore, the crooked paths are also associated with sizable probabilities. Now how does that work, exactly? Not enough arrows? Why? Let’s have a look at it. So nearby paths will interfere constructively, so to speak, by making the final arrow larger. 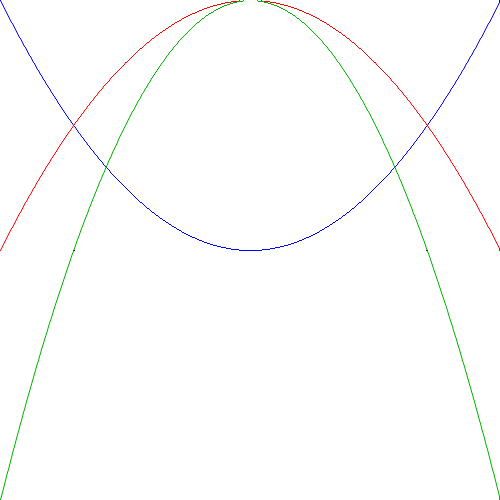 In order for that to happen, δS should be smaller than 2πħ/3 ≈ 2ħ, as shown below. We need to note a few things here. First, unlike what you might think, the amplitudes of the higher and lower path in the drawing do not cancel. On the contrary, the action S is the same, so their magnitudes just add up. Second, if this logic is correct, we will have alternating zones with paths that interfere positively and negatively, as shown below. Huh? What’s that? Can’t we add more paths? It’s a tricky question. We are measuring action in units of ħ, but do we actually think action comes in units of ħ? I am not sure. It would make sense, intuitively, but… Well… There’s uncertainty on the energy (E) and the momentum (p) of our photon, right? And how accurately can we measure the distance? So there’s some randomness everywhere. Having said that, the whole argument does requires us to assume action effectively comes in units of ħ: ħ is, effectively, the scaling factor here. So how can we have more paths? More arrows? I don’t think so. We measure S as energy over some time, or as momentum over some distance, and we express all these quantities in old-fashioned SI units: newton for the force, meter for the distance, and second for the time. If we want smaller arrows, we’ll have to use other units, but then the numerical value for ħ will change too! So… Well… No. I don’t think so. And it’s not because of the normalization rule (all probabilities have to add up to one, so we do some have some re-scaling for that). That doesn’t matter, really. What matters is the physics behind the formula, and the formula tells us the physical reality is ħ. So the geometry of the situation is what it is. Hmm… I guess that, at this point, we should wrap up our rather intuitive discussion here, and resort to the mathematical formalism of Feynman’s path integral formulation, but you can find that elsewhere.